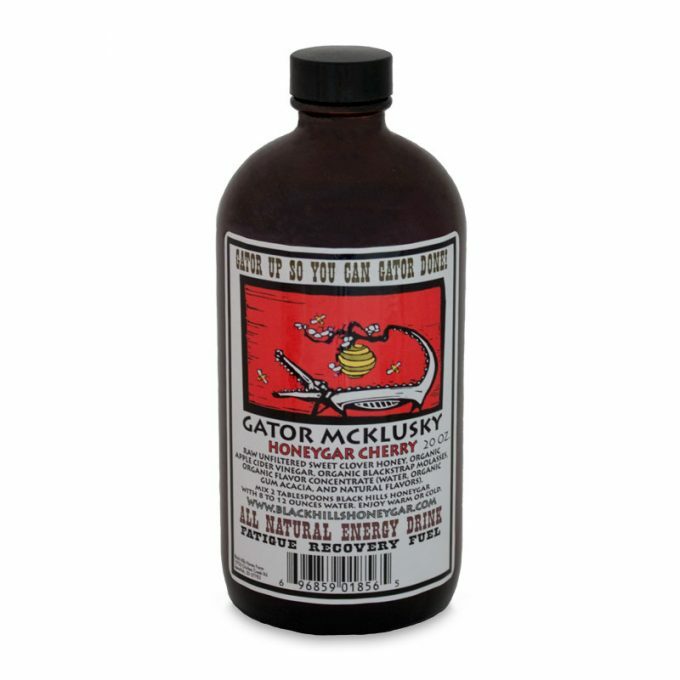 A delicious blend of raw unfiltered honey, apple cider vinegar, blackstrap molasses, and organic cherry flavor. Mix with water and enjoy! Buy 3 or more items in this category, save 10%! 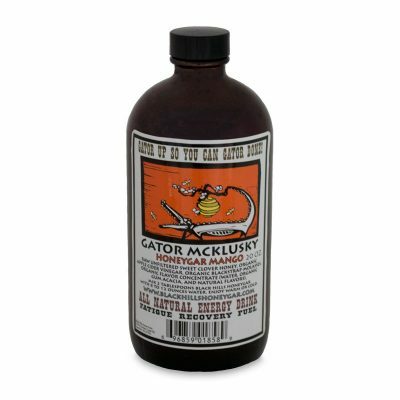 Gator McKlusky Honeygar Cherry is a blend of raw, unfiltered honey, apple cider vinegar, blackstrap molasses, and organic cherry flavor. 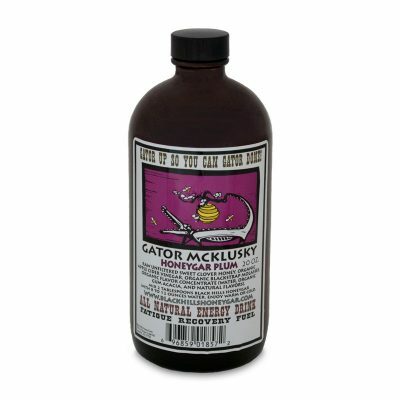 Mix two tablespoons of honeygar in eight to twelve ounces of warm or cold water and enjoy! 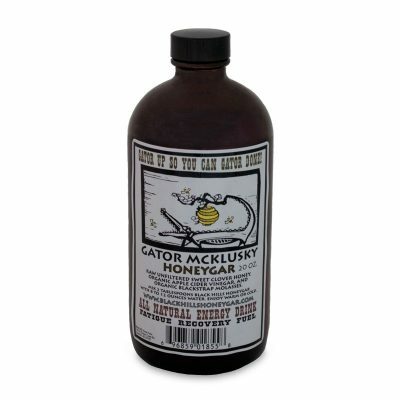 Each twenty ounce bottle of honeygar makes twenty 8-ounce glasses of Gator McKlusky. Honey has long been regarded by athletes as a “reserve fuel” that burns slowly and takes no energy to break down. Honey helps prevent muscle fatigue and recover rapidly from exertion. Vinegar immediately increases circulation and significantly reduces mental depression. Blending the whole apple (with the mother) and raw honey (with live enzymes and minerals) helps build good flora, cleans the digestive tract, and aids in the removal of calcium deposits from muscles and joints. Honeygar is an excellent source of potassium and helps reduce sinus infections, sore throats, and skin conditions such as acne. Vinegar immediately increases circulation and therefore moves stasis – be it emotional or physical. Due largely to its mineral content (especially potassium) and its ability to normalize the body’s acid/alkaline balance, apple cider vinegar has long been valued as a folk remedy. Internally, it cleanses the digestive tract. Its acidity aids in the removal of calcium deposits from joints and blood vessels without affecting normal calcium levels in the bones and teeth. Vinegar energizes the stomach and liver meridians, assists with digestion, and moves blood stagnation. Vinegar is warming and detoxifying; it quickly resolves liver congestion and can significantly reduce mental depression. Honey contains all of the vitamins which nutritionists consider necessary to health. It has been proven that bacteria cannot live in the presence of honey because honey is an excellent source of potassium. The potassium withdraws from the bacteria the moisture which is essential to their very existence. Potassium and sodium carry on a lifelong duel, fought over the supply of fluid. An individual cannot afford to lose potassium because it is the one mineral so necessary for proper performance by the nervous system. Black Hills Honeygar is an excellent source of potassium. Blackstrap molasses is high in iron, which is a vital mineral used by the body in its production of red blood cells. We build hemoglobin out of our food, and it has a certain power, carrying that all-important oxygen to our body tissues. Were it not for its iron content, hemoglobin would not have this property of holding oxygen. Great natural source of energy! I tried this a week ago and it was so good! We were on a motorcycle and didn’t have the space to buy some but will be purchasing soon! Please note: Only one review per product per person will be accepted. Thank you!